The Cairncross Review is in many ways the report Sir Brian Leveson should have written. He spent Â£5m and more than a year examining historic foul play at tabloids (which was already being effectively dealt with by the criminal and civil courts) whilst ignoring the existential threat posed to journalism as a whole by new media. The report published last night by Dame Frances Cairncross is largely, to use newsroom parlance, a cuttings job – relying on research which is already published. She has missed the opportunity, for example, to wring some answers from the likes of Facebook and Google about the extent to which their business models are reliant on professionally-produced journalism and details of the number of clicks it drives. Such answers might have helped us come up with a more detailed future funding model and revenue share system. Press Gazette is trying to plug this knowledge gap with our research into newspaper closures. Her report also falls short of the in-depth audit of local and national journalism which is desperately needed so we can understand the depth of the decline in public service newsgathering. She relies on second-hand extrapolated figures from Mediatique,Â for example, to produce a finger-in-the-air total of 23,000 frontline journalism jobs in the UK in 2007 versus 17,000 today. But overall she sums up the scale of the problem well and comes up with a series of practical solutions which urgently need to be implemented if â€“ as a society â€“ we want to protect democratic accountability and have a population which is informed by something other than the bile shared on Twitter and the banal banter and misinformation which often dominates Facebook. Most importantly her report recommends regulatory oversight of the relationship between the digital Duopoly â€“ Google and Facebook â€“ and the news publishers whose content they exploit. Regular readers will know this has been a bugbear of Press Gazette’s for some time, prompting us to launch our Duopoly campaign in 2017. Her recommendations tackle exactly the concerns we have raised since then – that Google and Facebook’s dominance risks destroying journalism. She rightly understands that their hegemony over search and social media respectively mean they are now a duopoly which publishers, either individually or collectively, cannot hope to take on without state help. 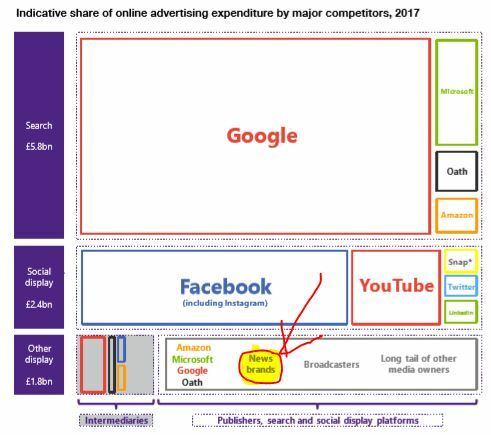 The following two images from the report aptly sum up the level of the decline in commercial revenue from news publishers and the extent to which Google and Facebook dominate todayâ€™s predominately online advertising market. As Cairncross puts it: â€œOverall, the unbalanced nature of the relationship between platforms and news publishers is a cause for concern, especially when combined with their larger market shares in the online advertising market. “The overall position online of Google and Facebook appears to be directly impeding the ability of news publishers to develop successful business strategies. â€œWhether or not the current monetary exchange between platforms and publishers is fair, the platformsâ€™ position allows them to take decisions with significant impact on publishers, but with little to no engagement with them. She proposes an exemption for publishers from anti-cartel rules which currently prevent them from negotiating collectively with the new media giants. And she also suggests a requirement for the largest online platforms to develop codes of conduct. Such codes have been implemented in the grocery sector to protect food suppliers from the worst excesses of the supermarket giants and in the TV sector to encourage public service broadcasters to support independent production companies. Dame Cairncross says: â€œThese codes would set out what should and should not be included in any individual negotiations with a publisher. Her recommendation for a Competition and Markets Authority investigation into the online advertising industry is also welcome. A blind man could see that Google has a monopoly position in search advertising and Facebook a monopoly in social media. So it is difficult to see how such an investigation could not end up making recommendations to protect smaller players, especially given the clear public benefit provided by journalism. The Cairncross recommendations on extending the VAT zero ratingÂ on print to digital subscriptions and exploring tax relief for public interest journalism are also welcome. And given the UK taxpayer currently provides Â£3.8bn to fund public service broadcasting (in a market where there is no shortage of broadcasters) it seems perverse that more public money isnâ€™t spent on illuminating the news blackholes which are developing around the UK. So the Cairncross recommendation that there should be direct public funding for public interest journalism at a local level is also welcome. But overall it is the changing nature of news publishers’ relationship with the digital giants which could be the most important legacy from this report. Cairncross has made clear that unless Google and Facebook act first to improve the terms of trade with the news industry this government (or more likely a future one) now has the evidence and a proposed strategy to step in and impose a settlement. I would recommend anyone seriously interested in the future of journalism reads the Cairncross Review in full, it can be downloaded here. The post Press Gazette applauds Cairncross Review plan to protect news publishers from Google and Facebook dominance appeared first on Press Gazette.